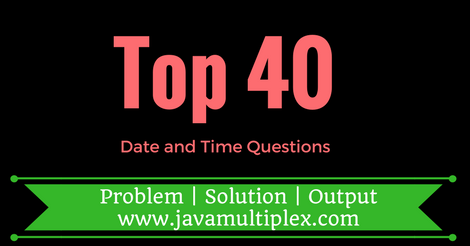 Hello friends, check out top 40 date and time questions with their solutions in Java. The solution of every question is very simple and straightforward. Note : If you have any other question please feel free to comment below or Contact Us. Thank you friends, I hope you understood all the solutions. If you have any doubt, suggestion or query please feel free to comment below. You can also discuss all the questions in our forum.